The sun sustains life on Earth, and maybe that's not all it does. Provocative new research by scientists in Norway suggests there may be a link between solar activity at the time of your birth and how long you're likely to live. 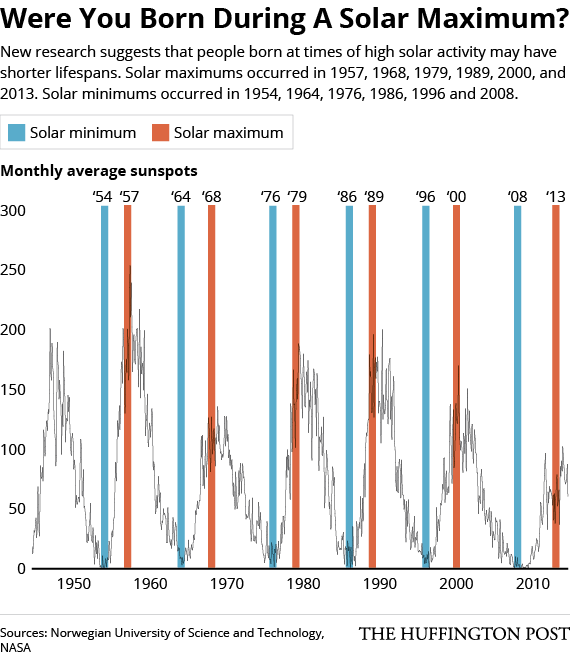 Specifically, the scientists found that the life spans of people born during a so-called "solar maximum" period--when the sun displays the greatest number of sunspots and solar flares in any given solar cycle--are about five years shorter than those of people born in a solar minimum period, when the sun is less active. "We were surprised of the effect on lifetime number of offspring, although only detectable in the low-[economic] status women group," study co-author Dr. Frode Fossøy, a researcher at the university, told The Huffington Post in an email. It seems that ultraviolet light from the sun--especially at times of high activity--can suppress certain molecular and cellular mechanisms in the body, Gine Roll Skjærvø, a senior engineer at the university and the lead author of a paper describing the research, told The Telegraph. "Moreover, their populations were located further south than our study populations," Fossøy said in the email. "These differences could explain the discrepancy between the two studies." Dr. Mark Lucock, a nutritional geneticist at the University of Newcastle in Australia, who was not involved in either study, called the new research "a fascinating piece of work that provides further supporting evidence that early-life environmental factors help shape [human traits] in ways that have long-term consequences," Live Science reported.